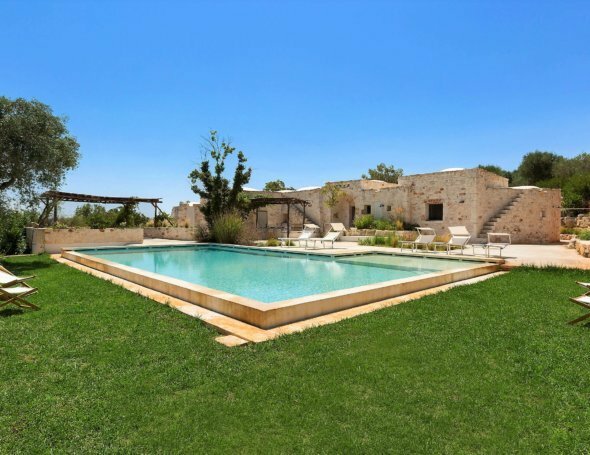 One of the most stunning white hill towns in Puglia, a short drive from the beach and within walking distance of restaurants and shops, Casa Albeda with fresh, contemporary style is an ideal base for a taste of authentic southern Italian life. Whitewashed and airy, with thick walls and domed ceilings, each room has been carefully designed and furnished for comfort and functionality. The oven, hob and sink fit perfectly under an arch in the kitchen which opens out to a private garden, one of the only gardens in Ostuni’s historic centre. With lemon trees, a little lawn and large wooden dining table, it is a gorgeous setting for dining and relaxing under the shade of cool, wooden, slatted covers. Along siesta at home is an essential part of the day here, so shelves stocked with books are on hand in the sitting room, while the bedroom feels luxurious and inviting with its massive steel-framed bed, hot tub and sea views over the garden for a panoramic view of the village to the impressive cathedral of Ostuni. Step out of Casa Albeda into the narrow streets and a variety of local shops and restaurants. 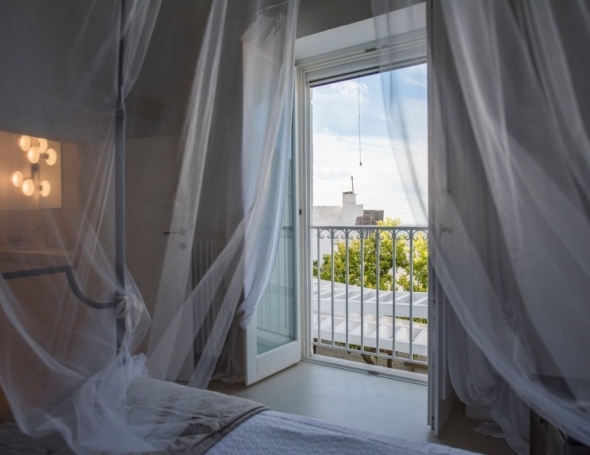 Being based in Ostuni is also ideal for easy access not just to the attractive beaches of Torre Merlata, Torre Canne and Torre Guaceto, but vineyards, olive groves and other historic towns such as Alberobello, Monopoli and Polignano a Mare, giving you a variety of options for exciting day trips. Kitchen, sitting room with sofa bed, double bedroom with hot tub, shower room, bathroom (without shower), private garden with dining table and terrace with jacuzzi tub.